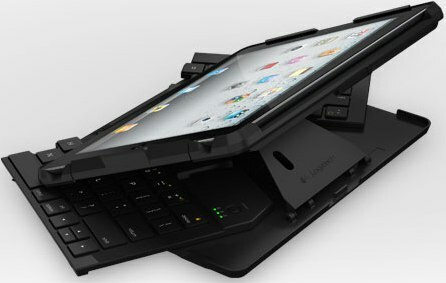 Apple's ipad 2 has two new releases from Logitech - a Fold-Up Keyboard and a Joystick. Lets ponder into more details of it. The Logitech Fold-Up Keyboard uses Bluetooth connectivity and has a hinged design. The keyboard turns off when it’s folded and will be on when unfolds. It comes with a full-sized layout, Powered by an internal rechargeable battery, the keyboard comes with a USB cord for recharging. It is compatible with Apple’s iPad Smart Cover. It will be available in September in US for $129.99 and available to pre-order today in Europe at a price of €99.99. 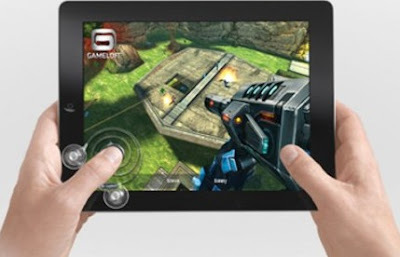 The Logitech Joystick offer a thumb-stick style game controller and is compatible with any game with an on-screen joystick or d-pad. It has two suction cups holding it in place attach to the iPad frame rather than the main display area and has coiled springs which brings back the joystick to center position. It will be available in September for $19.99. Tags: Logitech Fold-Up Keyboard, Logitech Joystick, Logitech Fold-Up Keyboard for ipad2, Logitech Joystick for ipad2, Logitech Fold-Up ipad-2 Keyboard, Logitech Fold-Up ipad-2 Keyboard features, Logitech Fold-Up ipad-2 Keyboard specifications, Logitech Fold-Up ipad-2 Keyboard review, Logitech Fold-Up ipad-2 Keyboard details, Logitech Fold-Up ipad-2 Keyboard availability, Logitech Fold-Up ipad-2 Keyboard specs, Logitech Fold-Up ipad-2 Keyboard images, Logitech Fold-Up ipad-2 Keyboard pics, Logitech Fold-Up ipad-2 Keyboard pictures, Logitech Fold-Up ipad-2 Keyboard imgs, Logitech Fold-Up ipad-2 Keyboard price, Logitech ipad-2 joystick, Logitech ipad-2 joystick features, Logitech ipad-2 joystick specifications, Logitech ipad-2 joystick review, Logitech ipad-2 joystick details, Logitech ipad-2 joystick availability, Logitech ipad-2 joystick specs, Logitech ipad-2 joystick images, Logitech ipad-2 joystick pics, Logitech ipad-2 joystick pictures, Logitech ipad-2 joystick imgs, Logitech ipad-2 joystick price.